Ah, Aglio Olio di Geri! Excuse us for living, but we make THIS recipe more often than any other pasta dish for our “Friday Night” routine! 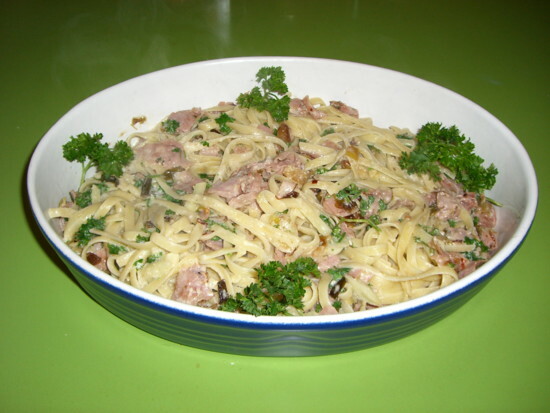 (If you missed that Post, you will find it below along with PastaPosts 1 and 2, the all-time favorite Spaghetti and White Clam Sauce and Pasta Filippo, respectively.) Incidentally, more of you click on these pasta recipes than any other topic on “Excuse Us…”! Agio Olio di Geri is, as it infers, Wife Geri’s take on the traditional simple, basic Sicilian Aglio Olio or Garlic and Oil. We’ll get to Geri’s recipe in a moment. But that old classic recipe is simply garlic, semi-finely chopped, lightly braised in oil, a little parsley, over your favorite spaghetti. We enjoy that too. We also have another version to “tame” the garlic flavor/taste. We call it “Dark Garlic and that one is fun too. We merely cut the garlic in long, flat horizontal pieces and braise it until it’s dark brown. This gives it a unique, pungent taste. But you have to have that pasta ready, and quickly, get that dark garlic and oil off the flame and onto the pasta just before it burns! –Try it! –Be daring! Anyway, back to Geri’s reinvention of Aglio Olio. She adds scallions, a little red pepper for a great kick, and, of all things, some ham, of course parsley, and even grated cheese! The old Sicilians must be rolling over in their graves as if we are guilty of committing “uno peccato,” a sin! –We love it over fettuccini! Final comment: The Ham! This came about because we wanted to add a little healthy protein to the pasta mix here. The surprise was the wonderful sweetness the ham added. But Geri cautions that the right ham “makes or breaks” this recipe. Her recipe calls for “Honey ham” from the deli and not baked Virginia ham and not boiled ham. What’s the difference? –“Miles different” and not the same thing nor as good by far. Trust us! We’ve tried it and it doesn’t work. This works and, boy, is it good! Mangia! Heat oil in medium sauce pan. Add scallions and garlic; sauté until tender, 3 min. Add red pepper flakes and Honey ham. Simmer slowly 15-20 minutes. Remove from the heat. Cook pasta in salted boiling water until al dente. Add above reserved pasta water to the drained pasta. Toss with sauce mixture and parsley. Add grated cheese and toss. Excuse us for living, but this is our all-time favorite “staple” as a pasta dish, I guess, because we have it more often than any other pasta recipe! Comments: Now or maybe after you make the recipe? Got home from the Mediterranean trip Friday late…and am still a tad “groggy” or should I say jet lagged…and with Bronchitis to boot! But I do have a question to ask you about the above recipe…. Why do you and Geri use Canola oil and not Olive oil? I would think that that is a major “sin”! bwahahahaha! Margaret! Welcome Back! I missed you here!!!! Geri & I imagined you all really needed to recupe after such an ambitious trip! Oh no, bronchitis! Not surprising though after all that travel. Get well! Someone else emailed the same question. Geri has always used canola as a healthy oil with a mild taste not changing the recipe. While olive oil is said to be so healthy, it was not thought so over the years back. We never got into it as our staple oil. But we use it now & then. But to our taste, depending on the type of olive oil, it can really change the taste of things. Thus, the recipe with canola. Rest & get well! “For it’s not so much the places we roam, as the place we return to called “home. '” Ah…….I wrote that a few years ago. This one looks so delicious! I am sure going to try this out!